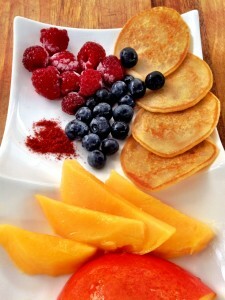 Allergy friendly pancakes for those who are very sensitive to food allergens. They are free of dairy, gluten and egg, and work best served with fresh seasonal fruit. 3 ½ Tbsp. Water or safe milk (rice/almond etc.). Adjust as needed for different flours. Mix all ingredients in a bowl until mixture is smooth. Heat a non-stick frying pan to medium heat and spray with either rice bran oil or coconut oil. Drop spoonfuls of batter into the pan. When bubbles appear on the surface (about 1 min) and they are golden brown on the bottom flip them over and cook for another minute or until golden and cooked through. Serve with sliced fruit and magic fairy dust!